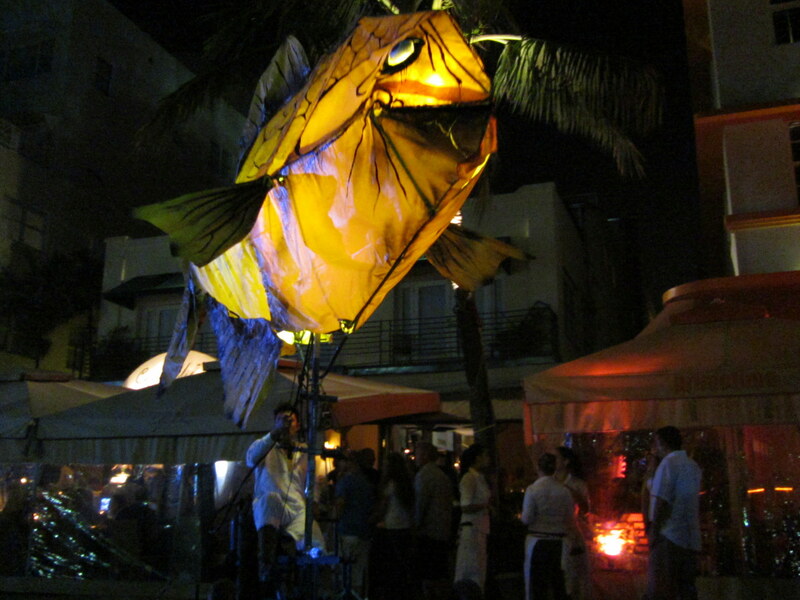 A fish puppet by Sarruga, a Barcelona-based street theater group. 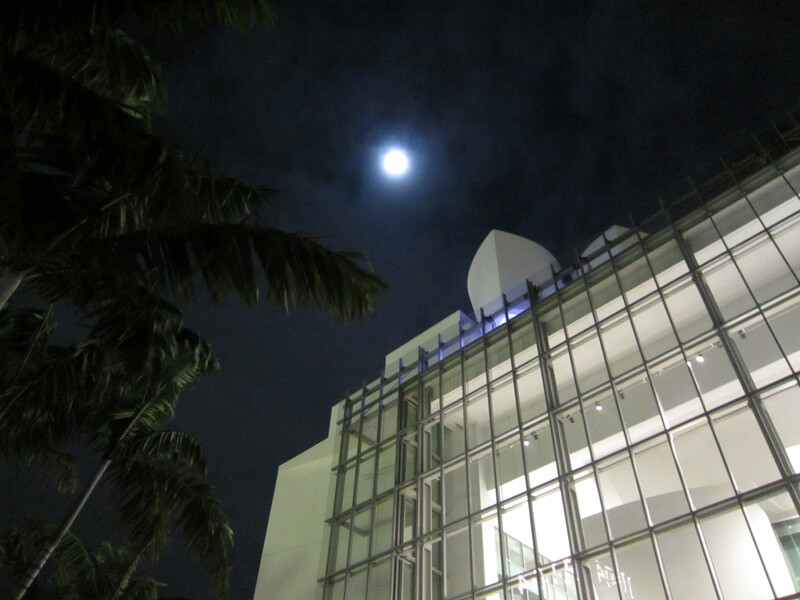 This picture, taken by my husband Johnny, was featured as photo-of-the-day on November 14 in Miami New Times blog. A few weeks before our November trip to South Florida, I read an article in the Travel + Leisure magazine that Miami Beach was going to host an event called Sleepless Night. I was so intrigued, that I decided to book a hotel for 2 nights in South Beach so that my husband and I could attend this festival. From the name, it shouldn’t be difficult to guess that something was going to take place all night long. And it wasn’t going to be just any party. 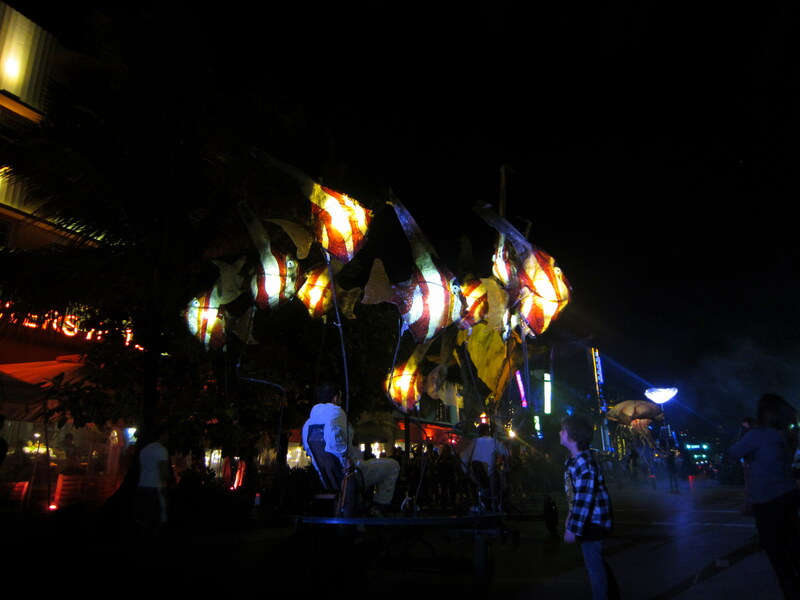 Sleepless Night is about showcasing art in different forms: music, theater, dance, sculpture, you name it. 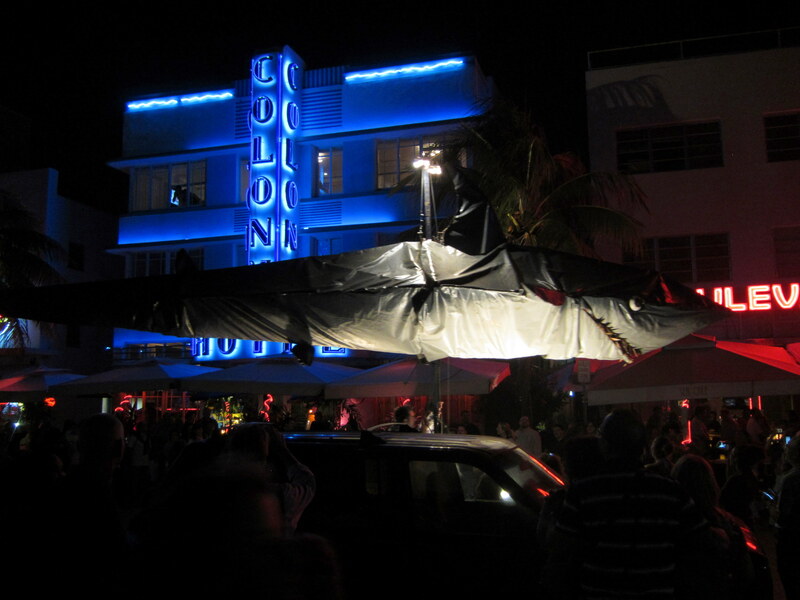 International and local artists would perform at various venues through out Miami Beach. This type of cultural celebration has actually been taking place at other world major cities, such as Paris (Nuit Blanche), Rome, Madrid, and Montreal. Who doesn’t love a Drag Queen? 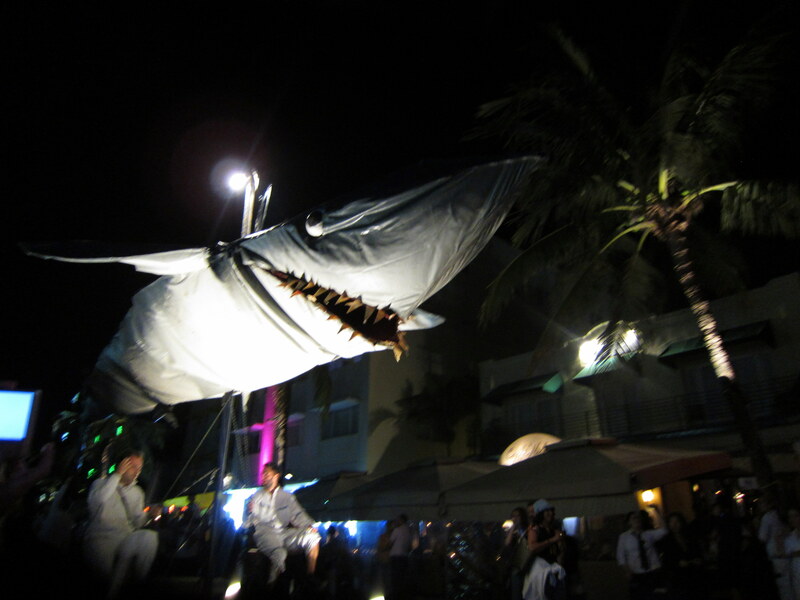 Of course there were lots and lots of other acts and exhibits taking place simultaneously at other parts of Miami Beach. However, we could only enjoy one performance at a time, and at times it was difficult to choose which one we would like to see. It was almost like sensory overload. Not to mention that there were so many people out and about, creating a party atmosphere like no other. What my husband and I loved about Sleepless Night was that some of the art form showcased here was quite avant-garde. When I read the Travel + Leisure magazine about this event, the one group featured in the article was Sarruga, a Spanish street theater company. 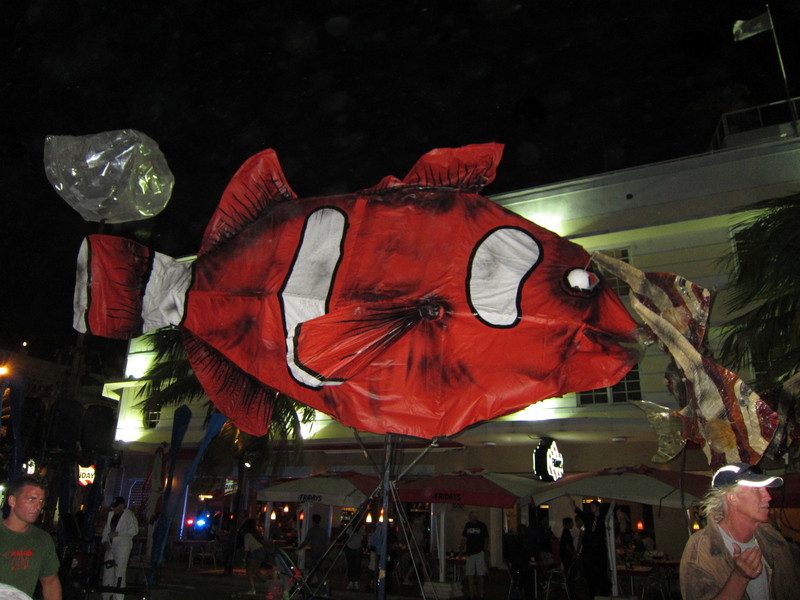 Johnny was very excited to see them bicycled down Ocean Drive with their illuminated fish sculptures. It was a sight not to be missed! Fish floating along Ocean Drive, by the Atlantic Ocean. It couldn’t get any better than this! So far we had been having a really good time at the festival. What could be better than walking around the beach while enjoying some culture? The only thing that hampered this otherwise awesome night was the intermittent rain and strong winds. Some events were canceled due to the weather, while a few others were delayed. 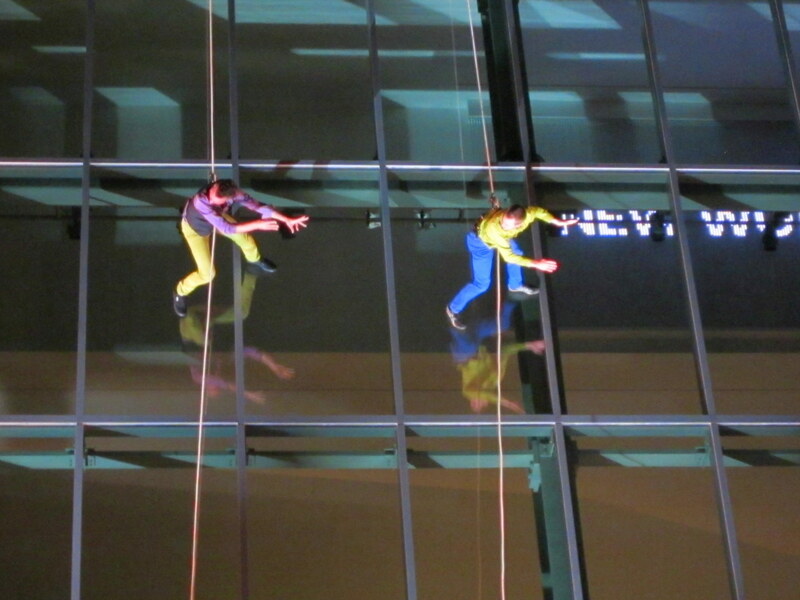 At around 9:45 PM, Johnny headed to the New World Center to catch a performance by Project Bandaloop, an aerial dance troupe. However, he and everyone else had to wait for over an hour before the program started. Those who waited and did not leave were greatly rewarded for their patience. 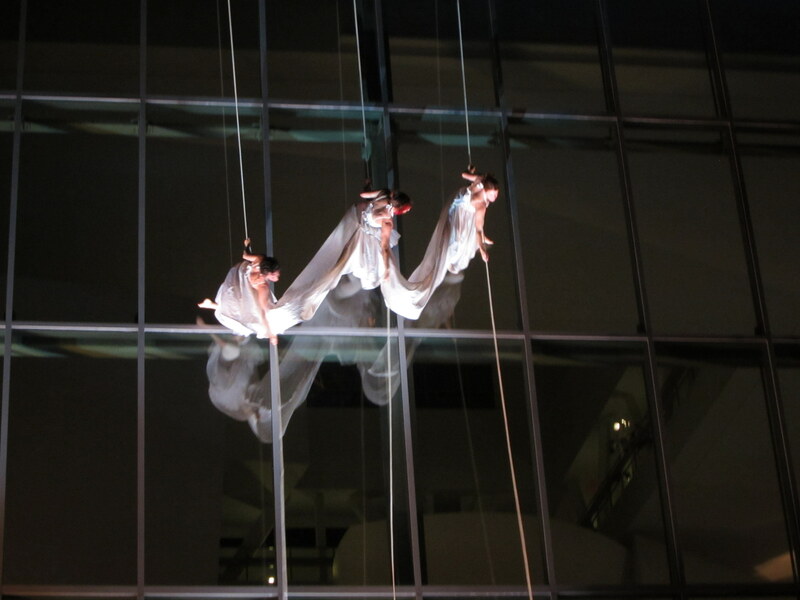 Project Bandaloop is a group who challenged the notion of performance space. Who says you can’t dance on the side of mountains, cliffs, a fort, or in this case, a slippery glass building thanks to the rain? Accompanied by Dana Leong on his electric cello, the dancers’ moves seemingly defied earth’s gravity, and were simply beautiful and breath-taking. The gracefulness of these vertical dancers no doubt captured the heart of the audience. Project Bandaloop supposedly drew the largest crowd at the festival. After a long day, we took a break and rested back at our hotel. 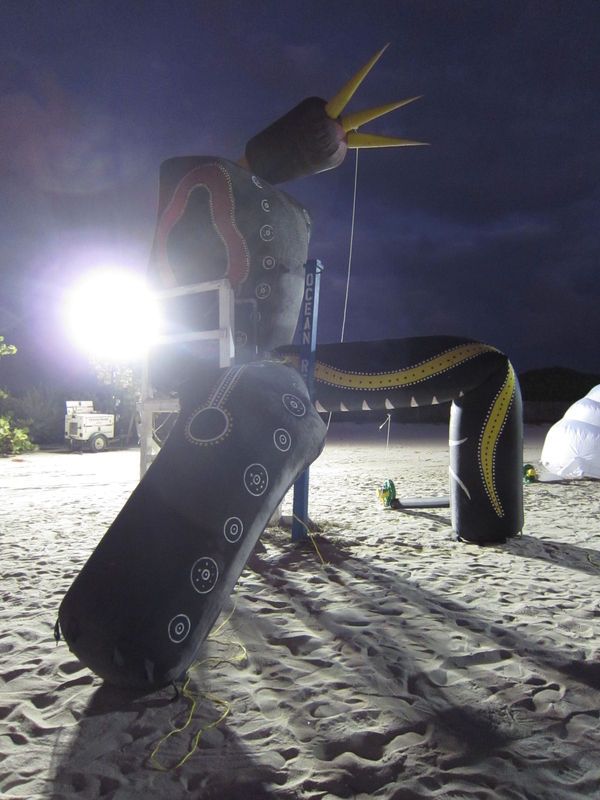 However, at around 1:30 AM we decided to head back to Lummus Park, hoping to catch a production by The Dream Engine. 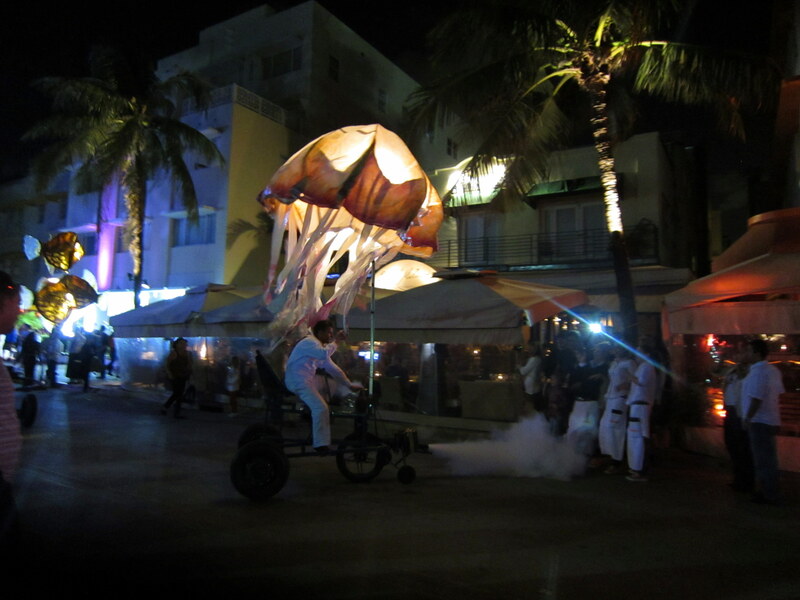 This group also does aerial shows, and was supposed to start going down Ocean Drive at 1:45 AM. We waited for about 15 minutes, and was then told by a staff member of the festival that it had been cancelled due to strong winds. 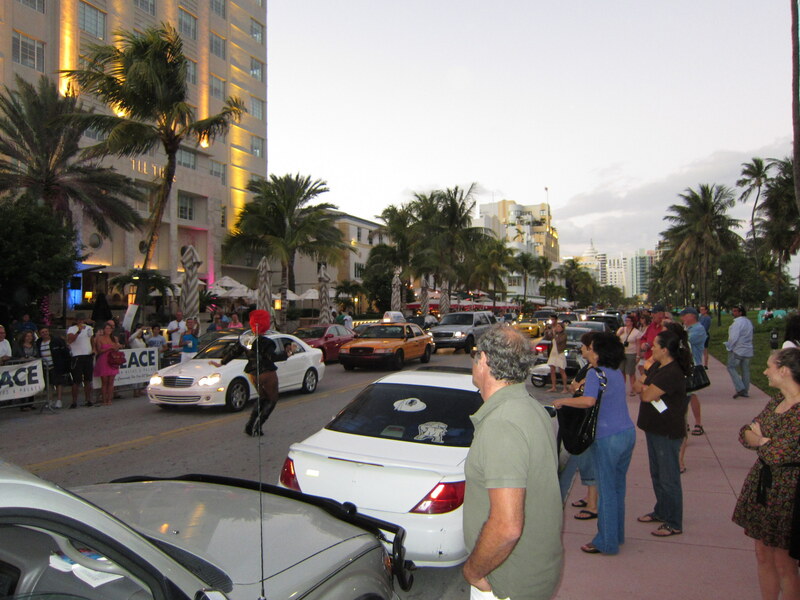 Although thousands of people were still out on the streets, and the party was not supposed to be over until 6 AM, there seemed to be a lack of activities planned around the busiest part of South Beach at these wee hours. We were a bit disappointed, but understood that weather conditions did a play part on the changes made to the program. Johnny and I were so glad we had the opportunity to attend Sleepless Night 2011. 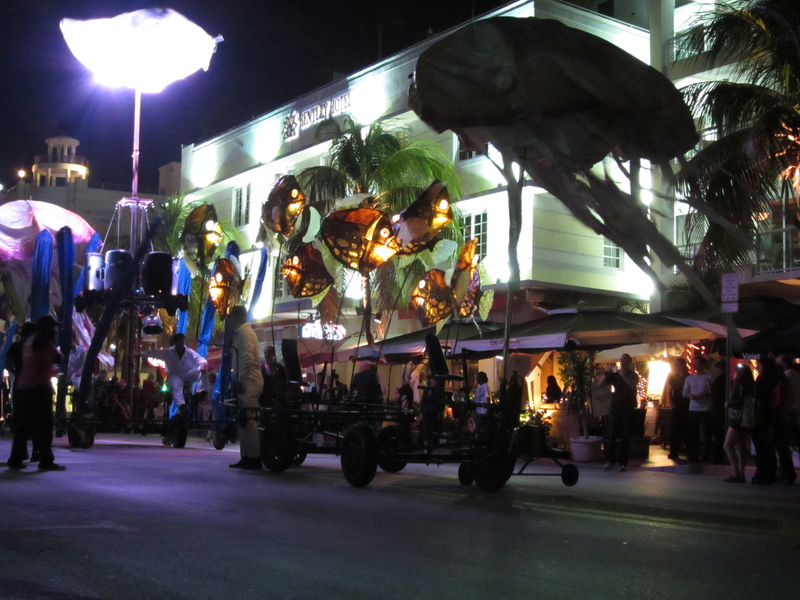 Miami Beach was the perfect setting for this soiree, and we came home with a new appreciation for the arts. To learn more about these festivities, you can visit their website at sleeplessnight.org. After all, it’s never too late to plan to stay up all night long comes November of next year!